Okay, I can't wait to give you this from the Calvary Chapel decision. It seems that the Discovery Institute's Own Foot Firing Squad was out in force for the case. 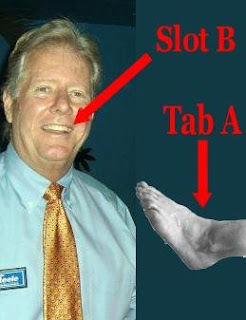 In particular, Michael Behe managed to discharge a round into the plaintiff's oxfords. (1) "'Whatever the Bible says is so; whatever man says may or may not be so,' is the only [position] a Christian can take . . . ."
(2) "If [scientific] conclusions contradict the Word of God, the conclusions are wrong, no matter how many scientific facts may appear to back them." (3) "Christians must disregard [scientific hypotheses or theories] that contradict the Bible." Based in no small part on Behe's testimony, the court found the there was, at least, a genuine issue of material fact as to whether the rejection of the plaintiffs' biology courses was reasonable. Didn't these people know what happend the last time Mikey got near a courtroom? There has been an important decision in the case brought by the Association of Christian Schools International and Calvary Chapel Christian School against the University of California, which claims that UC's rejection of various courses prepared and taught by the plaintiffs for status as "approved courses" for admission requirements is unconstitutional. The decision is 49 pages long and complex, but I'll try to give a "bottom line." There were two broad claims by the plaintiffs: 1) that the admission policies themselves violate the Free Speech Clause, the Free Exercise Clause, the Establishment Clause and the Equal Protection Clause of the First Amendment and 2) even if the policies as written are not unconstitutional, they are being applied in an unconstitutional manner. Plaintiffs erroneously argue that the UC course review process "render[s] Christian school students ineligible for ninety-eight percent of the seats in the entering class" because of rejected Christian school courses. Even setting aside that students have alternative ways to demonstrate proficiency in the A-G Subjects, eighteen percent of California students are admitted without needing to demonstrate proficiency (not two percent, as Plaintiffs contend). Further, if ninety-eight percent of Christian school students were ineligible, Plaintiffs should be able to identify a significant number of students excluded from UC because of the course review process. Yet, "Plaintiffs do not show, and there is no evidence, that even one [Association of Christian Schools International] student has been denied UC eligibility as a result of any actions challenged" in this case. The court found that "there is no genuine issue of material fact" that UC was rejecting any courses simply because they included a single religious viewpoint. Essentially Calvary was arguing that even if a course otherwise met UC's academic standards, but added religious content or a religious viewpoint, it was unacceptable. Instead, the court found outright that "Defendants do not have a 'well-established practice' of rejecting courses that contain standard content, but add a single religious viewpoint." Similarly, the court found that "Defendants do not have a 'well-established practice' of rejecting history courses because they 'add a Christian god' or 'one religious perspective.'" Once more, there is no genuine issue of material fact as to this issue. Defendants do not have a "well-established practice" of rejecting biology courses that add theistic evolution, ' intelligent design, creation, or weaknesses of evolution. Heightened scrutiny is inappropriate here. If [UC's] Guidelines and Policies are rationally related to the goal of selecting the most qualified students for admission, they do not violate the First Amendment" guarantee of free speech. Under the "rationally related" test, the court found that there is no genuine issue of material fact as to UC's "Position Statement on Religion and Ethics Courses," which requires such courses "treat the study of religion or ethics from the standpoint of scholarly inquiry rather than in a manner limited to one denomination or viewpoint" and "should not include among its primary goals the personal religious growth of the student," meeting the test. The court found "The UC Position Statement on Religion and Ethics Courses is reasonable." Plaintiffs base their claims against the UC Position Statements on Science and History Courses on the false assertion that these Position Statements require a secular curriculum without religious viewpoints. [Quoting from Plaintiff's brief: "In other words, there must be a 'secular history curriculum' without religious viewpoints." and "The [Science] Position Statement also means that only a 'secular science curriculum' (no religious viewpoint added) is approved."] Yet, the Position Statements do not use the word "must"; rather, they use the word "can", indicating that a "secular" curriculum is not mandatory for approval. Indeed, ... Defendants have approved numerous science and history courses that incorporate religious viewpoints. The rest of the Position Statements reinforce the purpose of the [UC] Guidelines: Admitted students must attain "essential critical thinking and study skills," "the necessary preparation for courses, majors, and programs offered at [UC]," and "a body of knowledge that will providebreadth and perspective to new, more advanced studies." There is no genuine issue of material fact as to this issue. The UC Position Statements on Science and History Courses are reasonable. Without beating a dead horse, the court went on to find that all of the UC policies survived constitutional review on their face, leaving the plaintiffs with the difficult task of showing that UC had an actual policy to violate the plaintiffs' First Amendment rights by its application of the guidelines. If it is not quite a rout, the plaintiffs chances of winning have been greatly reduced. There is more of interest that I will blog on but that should hold you for a while. Update: Andy Guess at Inside Higher Ed has more background on the case for those unfamiliar with it. Ed Brayton at Dispatches From the Culture Wars has also posted about the decision. And not ot be outdone, Mike Dunford has three posts about the decision up at The Questionable Authority. There is now a copy of the decision available in pdf format courtesy of the University of California. Q: York County was recently in the news for a lawsuit involving the teaching of intelligent design. What's your attitude regarding the teaching of evolution in public schools? A: "I'm a Christian, and I believe in parents being able to provide children with religious instruction without interference from the state. But I also believe our schools are there to teach worldly knowledge and science. I believe in evolution, and I believe there's a difference between science and faith. That doesn't make faith any less important than science. It just means they're two different things. And I think it's a mistake to try to cloud the teaching of science with theories that frankly don't hold up to scientific inquiry." I'm saying that maybe all these classes should not be so clearly separated from one another. Maybe all of them belong, to a certain extent, together. When Issac (sic) Newton was doing his study of the laws of physics and motion, he said he was trying to understand how God had ordered the universe and what the work of God had been. He was showing God's handiwork. Maybe when people say they are working on intelligent design, they are just expressing God's handiwork. Maybe when the Darwinists are explaining evolution, they're explaining God's handiwork. I'm a little suspicious of putting everything into neat pigeon holes. First of all, as Ken Miller, Francisco Ayala and Theodosius Dobzhansky have shown, a person can be respected, even revered, member of both the scientific and academic communities and still express a belief that science reveals "God's handiwork." Contrary to Stein's and the movie's accusations, that's not what the alleged "victims" were "expelled" for. The ill effects, to the extent there were any, that the ID advocates felt were for attempting, as Stein admits, to illicitly blur the lines between philosophy and religion on one side and science on the other. The reason that Stein is "suspicious of putting everything into neat pigeon holes" is easy enough to see in his recent babblings about science ... he lacks the intellectual rigor to understand science and/or the honesty to differentiate between it and religion. That sort of confusion of ideas is bad enough in academia, fully warranting derision and an unwillingness to confer lifetime jobs on the perpetrators. But in K-12 education, deliberately blurring the lines between religion and science is an unconstitutional assault on the freedom of religion. I suspect Stein's sanctimonious and saccharin screeds to patriotism hide, at heart, a deep distaste for the American form of government. Darwinism holds that life began by something like lightning striking a puddle and inorganic matter was converted into living matter. And from that, after four-and-a-half-billion years came the foundation of life as we now know it, the organic living cell. Now I had thought that a cell was just a mass of Jell-O. … I was just floored that supposedly from that [process] came the living cell, which has hundreds of thousands, or maybe millions of small tiny intricate parts that have to work together to maintain, repair, reproduce and adapt the cell. And the idea that lightning striking a mud puddle creates something as complex as a cell struck me as so far fetched that it deserved to be questioned. As an explanation of current hypotheses about abiogenesis, to quote Wolfgang Pauli, "That's not right. It's not even wrong." Darwinism said, and it was very, very quickly picked up enthusiastically in Germany, that there were certain species that were superior to other species; and even within those species there were certain smaller groups that were superior to other groups; and all were competing for a scarce supply of food and resources and that if you let the inferior race have a big share of the food and other resources, there was less left for the superior race and therefore the superior race would not evolve to be as powerful as quickly as it should. You owe it to the master race to kill the inferior races. This was explicitly a part of Nazi ideology. Let's see ... Stein accuses Darwin of fomenting Nazism and, by extension, accuses all modern biologists of seeking some sort of vicious "Social Darwinism" and then pretends not to understand the anger? Either he is the stupidest man on Earth or the sleaziest. 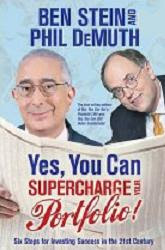 I suppose some people might think that hosting game shows, writing books like Yes, You Can Supercharge Your Portfolio! 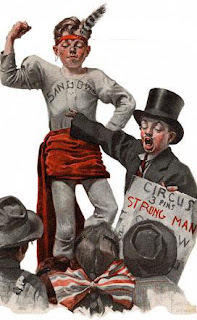 : Six Steps for Investing Success in the 21st Century and speechwriting for politicians of dubious character makes someone part of the intelligentsia. But, if so, most people whose intellect I admire would doubtless decline membership in the club. You can hear him utter the ironic words at skepchick, taken from yet another demonstration of why Julia Sweeney called Stein "spectacularly ill-informed and narcissistic and weirdly devoted to his schtick and worst of all, hacky." More reality-based accounts of the occasion can be found at PZ's place; Evolved and rational; Life without faith; Panda's Thumb; and Dispatches from the Culture Wars. It goes on to list other common denominators of fundamentalists. The list includes dogmatic faith; faith serving as a defining identity; fear -- of the different, of change, of ambiguity and of uncertainty; and a will to political power. "Ironically, the faith that should elicit a higher form of morality easily descends into giving one permission for the ends to justify the means, because one is fighting for God." The distinction between healthy faith and militant religion is narrow, [Dan] Stiver acknowledged. People of faith often gravitate to extreme positions because of what they seek in and for themselves, the scholars stressed. "It's usually defined by a pretty tight system of labeling what's right and wrong -- black-and-white thinking. There's good, and there's evil. "Out of that comes a great deal of energy that motivates one to fight. The sense is you get a lot of fulfillment, identity, purpose and meaning in one's faith from fighting this good fight." [F]ear causes some other typical characteristics -- a glorification of the past or of orthodoxy, a certainty about one's own faith or interpretation of one's own faith; an entrenchment mentality, a feeling that 'truth' must be guarded against encroaching heresy and difference, an unwillingness to fellowship with/cooperate with/tolerate those who see faith issues in another way." Oh, hey! That just described Dr. Michael Egnor and the rest of the Discovery Institute, didn't it? …greater science literacy, which is going to lead to the erosion of religion, and then we'll get this nice positive feedback mechanism going where as religion slowly fades away we'll get more and more science to replace it and that will displace more and more religion which will allow more and more science in and we'll eventually get to the point where religion has taken that appropriate place as a side dish rather than the main course. And if you separate out the ethical message from religion — what have you got left — you got — you got a bunch of fairy tales, right? In the midst of a furious national debate about intelligent design, Darwinism, and metaphysical bias and indoctrination in science education, one has to wonder why Dr. Myers would state plainly that the agenda of Darwinists is to advance atheism in the classroom. Why would Dr. Myers state unequivocally on film that a fundamental goal of science education is the suppression of religious belief? The most parsimonious explanation is that he means it. Now, I seriously doubt that PZ thinks the primary purpose of science education is to indoctrinate students in metaphysics of any sort, including atheism. Certainly, even if he did, the vast majority of scientists and teachers would not agree. PZ, I think, considers it, at most, a happy side consequence of science literacy, that it makes it harder to be religious, a fact admitted by thoughtful theologians, such as John Haught, particularly when it comes to the sillier "biblical literalist" sort of belief. What's funny is the admission by a medical doctor that teaching science, as it has been conceived since at least the time of Francis Bacon, is so deadly to the sort of faith that he admires that it needs to be protected from the facts of the world. If Egnor's faith is such a pale and crippled thing, how does he expect to survive in any case? Update: PZ has replied to Egnor in the manner I expected. Keep Those Card's Posters Coming! Does this qualify as a quote mein? To ensure I don't wallow in the same undefined morass as the Darwinists, "microevolution" would be the proven part of evolutionary theory that includes things like a bacterium becoming resistant to antibiotics and cows being bred to have more meat. "Macroevolution" is Darwin's original theory that all life stems from a common single-celled ancestor. Macroevolution is entirely unproven. It hypothesizes that our original "ancestor" went through a series of gradual changes that led to it becoming a new type of organism. It further hypothesizes that through thousands of iterations of this process, you and I are here today. There is no fossil evidence of this happening nor has it ever been replicated in the laboratory. The sole purpose of the Academic Freedom Act that Storms introduced is to protect teachers and students from persecution if their investigation of evolution leads them to conclusions that differ with the "party line" as it's stated in the standards. Yet, those who are using the authority of the Florida Department of Education to impose the religion of evolution are railing against Storms and claiming she is using her position to introduce religious teaching into the classroom when that's exactly what they are doing! Note the definition of "microevolution" as "evolution that even I can't deny." Despite the massive amount of evidence for common descent and his ignorance of what the fossil records really shows, Mr. Kemple insists that "macroevolution" is "unproven" and a "religion." This is, of course, a sample of the bilge that Floridians can expect to be called "germane current facts, data, and peer-reviewed research" if this law is passed. It's pretty hard to "prove" anything to someone with his fingers buried knuckle-deep in his ears, his eyes screwed tight shut and humming "Nearer My God to Thee" as loud as he can. Storms said the law specifically prohibits discussion of creationism and intelligent design. She said a teacher might say: "Here's the theory of evolution and here are the flaws and here are the breaks. Here are the people with legitimate questions. Here's what the theories are." David Brackin, an Orange County teacher who came Wednesday's hearing but did not testify, said he would appreciate such a law. When he began teaching 23 years ago, Brackin said he taught students that there are "missing links" in the fossil evidence that led him to question evolution. "You don't find any partial-bat partial-rats," he said. An assistant principal heard Brackin and told him to stop teaching religion, he said. "I don't want to say evolution is fact. I don't want to say intelligent design is a fact. I want my kids to question. I want to be able to do that without being dragged into the office," Brackin said. I can only make sense of all this if Storms and the rest are laboring under the delusion that the word "teach" is synonymous with "assert the truth of." Unfortunately for them and the children of Florida, who will see millions of dollars better spent on educating them thrown down a legal rat hole if this law passes, the courts understand that "teaching" includes "presenting as a valid alternative." It's all Tiktaalik's fault! If it had just stayed where it was, Florida would have been spared certain brainless mammals entirely! How do we get out of an impasse in which both sides seem not to realize that, in the end, their viewpoints are founded on impressions of reality and metaphysical convictions that cannot be proven to their opponents? Speaking of a personal creator whose existence is inexplicable is no more and no less obvious and self-explanatory than a multiverse that just happens to exist and, thanks to its inexplicably being infinite, inevitably produces a universe that can support life, in which we happen to be. Whatever the quality of Florida's state legislators, The Professional Staff of the Education Pre-K - 12 Committee is certainly on the ball. Here are some of the more relevant parts of the Staff's "Bill Analysis and Fiscal Impact Statement" for the oxymoronic "Academic Freedom Act" presently pending in the State Senate. The bill also references “objective scientific information;” however, it does not define these terms either. Again, the afforded protections would be undermined by a lack of a clear definition of protected conduct. Additionally, the bill is silent on who defines the objectivity of the scientific information presented. The administration and the teacher may have quite different views on the objectiveness of the information presented. The bill is silent on the school district’s or principal’s authority to discipline a teacher for failing to teach the standards. Presumably, if the teacher is protected when delivering the alternate instruction in addition to the standards, the teacher is not protected for failing to teach the standards or teaching the alternate instruction in lieu of the standards. This should be made more explicit. The First Amendment affords ample freedom of religious expression; however, it does not necessarily include the right for a teacher or a student to have an audience held captive or to require other students or teachers to participate or adhere to specific doctrine. Accordingly, while teachers retain their First Amendment rights, public schools may limit classroom speech to promote educational goals. School committees may regulate a teacher's classroom speech if the regulation is reasonably related to legitimate pedagogical concern and the school provides the teacher with notice of what conduct was prohibited. A teacher's statements in class during instructional periods are part of the curriculum and regular class activity and thus subject to reasonable speech regulation. There is more in the report [pdf file] that is worth reading but the above is enough to show that, if this law is enacted, Florida, already in the throes of a budget crisis, would be doing nothing more than throwing away taxpayer money to soothe the narrow apologetics of some of its citizens -- money that would be better spent on the education of all its young people. As used in this section, the term "scientific information" means germane current facts, data, and peer-reviewed research specific to the topic of chemical and biological evolution as prescribed in Florida's Science Standards. The other amendment that is at all relevant changes a provision that students "may be evaluated based upon their understanding of course materials" to "shall be evaluated based upon their understanding of course materials through normal testing procedures." The first amendment appears more cosmetic than real, in that it does not do anymore than add the equally vague "germane current facts [and] data" without any guidance as to how to evaluate what counts as "facts" and "data" or who is to decide that. The addition of "peer-reviewed research" will, no doubt, revive much ballyhooing of the Discovery Institute's list of "peer-reviewed" articles and books without any semblance of relevance to the actual lessons being taught or the appropriateness of that material to the level of understanding of the students. In short, it will be waived at the students as some sort of evidence that something, somehow is wrong with evolution, instead of actually being evaluated, an utterly bogus form of "education." The second still doesn't address the question of disciplining teachers for failing to teach the material in the standards fully or what happens if the students don't know the course materials. If you are a Florida citizen, go to the list of legislators at Florida Citizens for Science and call, write and email yours to express your opinion. Rest assured the anti-science forces will be. Update 03/26/08: The bill passed its first hurdle in the Senate, being approved by the committee on a 4-1 vote. There are more hurdles to go but any Florida citizen in favor of good science education had better get busy on working on their legislators. In the little corner of the blogosphere I haunt it is easy enough to find recitals of the bad things done by religions and their adherents. That's why it is only fair to take note of some of the good things we run across, like this: "Canadian church magazine is first to sponsor Darwin exhibit." The United Church Observer, the independent magazine affiliated with The United Church of Canada [a union of Methodist, Congregationalist and Presbyterian churches], is proud to announce it has become a sponsor of "Darwin: The Evolution Revolution," a travelling exhibition focusing on the life and work of Charles Darwin currently on display at the Royal Ontario Museum in Toronto. "Frankly, I'm alarmed by the apparent creationist chill that has greeted the Darwin exhibit wherever it has been mounted," said Mr. Wilson. "This magazine has reported on the evolutionary wars in the U.S., and if there's one thing we've learned, it's that the politics of creationism and intelligent design are more bark than bite — and the bark is only as loud as people's fear of it. The Darwin exhibit deserves support, and we're not afraid to say so." We can call it Exposed! The Minneapolis/St. Paul City Pages! Premise Media’s chief top has issued a press release with yet another version of his Good Friday self-crucifixion. PZ Myrrrzz beat me to it and stomped all over Mark Mathis' untruths and kicked dirt on the broken pieces. There is little for me to do but point you toward the wreckage of another pack of lies. The majority opinion leaves open at least two alternatives to indoctrination in evolution and censorship of scientific alternatives: (1) the right of teachers to teach "a variety of scientific theories" and to bring Scopes-type lawsuits if punished or prohibited, and (2) the right of schools, school districts, and perhaps legislatures to encourage or require teaching of "all scientific theories . . . about origins." A law encouraging teaching of all scientific theories about origins"? ... Now, where have I heard that before? Speaking of Mooney, however, of late he and Matt Nisbet have been criticizing PZ Myers and Richard Dawkins for attacking the movie producers of the faux horror flick, Expelled, and religion in general, on the grounds that vocally atheistic proponents of science are bad for the "framing" of the debate. I have to say I fall on the John Wilkins, John Lynch, Sean Carroll and Brian Switek side of this fence. I personally find that PZ, Dawkins and others of the so-called "New Atheists" can sometimes be needlessly provocative. I thought PZ's post on Easter to the effect that it was intended to "celebrate the day they were hoaxed by a gang of Middle Eastern charlatans" was, to say the least, gratuitous. And any suggestion that science and atheism are one and the same thing is wrong. But when they are themselves involved in displays of disingenuousness and stupidity by creationists, the notion that PZ and Dawkins should "[l]ay low and let others do the talking" is ludicrous. Frankly, anyone who, like the ID crowd, would attempt to lay the Holocaust at the feet of Darwin or science in general deserves just about any verbal treatment they get in my book. If nothing else, it would be bad "framing" for them to remain quiet. The creationists were quite quick to publicize Dawkins' presence at the event and silence on PZ's and Dawkins' part would have been trumpeted by the IDeologists as a sign of their "guilty consciences" for having "gate crashed" the screening. And if people do go to see the movie because they have heard about the kerfuffle, so what? Most Americans, knowing nothing about the dispute, are in favor, as Americans are wont to be, of allowing "both sides" to be taught. Maybe, primed with what PZ and Dawkins have said about it, they will come away with an appreciation of just how shallow and, when it comes right down to it, dishonest ID and its proponents are. In the end, I would rather be tied in the public's mind to people who straightforwardly, if abrasively, state their beliefs than with the sneaks making up the "cdesign proponentsists." Stein asked [philosopher Michael] Ruse how life originated. Ruse's immediate impulse (as mine would have been) was to launch into an honest effort to explain a difficult scientific idea. He began by saying that he doesn't know how life originated, and nor does anybody else. At this point in his interview, Ruse probably had no notion that his interlocuter had a completely different agenda to promote, with no hint of sincerity to balance his own. Ruse patiently explained that the origin of life (nothing to do with the Darwinian theory itself but the necessary precursor of Darwinian evolution) is an interesting and unsolved mystery, one that scientists are actively working on. By way of example, Ruse could have chosen any of a number of current theories. He chose just one (it would have taken too long to explain them all) purely as an illustration of the kind of properties such a theory must have. He happened to choose the theory proposed by the Scottish chemist Graham Cairns-Smith, that organic life was preceded by a strange and intriguing world of replicating patterns on the surfaces of crystals in inorganic clays. At no time did Ruse say he believed the Cairns-Smith theory, only that it was the KIND of theory that scientists are actively examining, as a CANDIDATE for the origin of evolution. Stein just loved it. Mud! MUD! The sarcasm in his grating, nasal voice was palpable. Maybe this was when Ruse realised that he had been had. Certainly it was at this point that he started to show signs of exasperation, although he may still have thought that Stein was merely stupid, rather than pursuing a malevolent and clandestine agenda. Stein kept returning, throughout the film, to the phrase "on the backs of crystals", and the sycophantic audience in the Minneapolis cinema dutifully tittered every time. Genesis 2: 6 But there went up a mist from the earth, and watered the whole face of the ground. .........2: 7 And the LORD God formed man of the dust of the ground, and breathed into his nostrils the breath of life; and man became a living soul. [I]t is as respectable to be modified monkey as modified dirt. Jonathan Wells has responded to Larry Moran's challenge and, predictably, flunked. As you may remember, this involved a round robin contest between Wells, Larry, PZ Myers and Dr. Michael Egnor. Wells had claimed, as Dr. Egnor put it, "that research on antibiotic resistance wasn't guided by Darwinian evolutionary theory." As I noted, Egnor was using his own definition of "Darwinism," as creationists are wont to do. Wells trots out yet another, calling it: "Darwin's claim of universal common ancestry and his exclusion of design." Then, disingenuously, he accuses Larry and the rest of the scientific community of equivocation when, in fact, it is the creationists who have been doing the mangling of the language of science from the very beginning. Theodosius Dobzhansky noted that there was still no hard evidence to connect small-scale changes within existing species (which he called "microevolution") to the origin of new species, organs and body plans (which he called "macroevolution"). Dobzhansky wrote: "We are compelled at the present level of knowledge reluctantly to put a sign of equality between the mechanisms of macro- and microevolution, and proceeding on this assumption, to push our investigations as far ahead as this working hypothesis will permit." Contrary to Wells' statement that Dobzhansky was making an "extrapolation from microevolution to macroevolution," Dobzhansky clearly stated he was referring to the question of what mechanisms are at work at different levels. Furthermore, the real scientific disputes over microevolution versus macroevolution have nothing to do with the evidence for common descent, which is myriad and beyond anything except unreasonable doubt. God … doth accomplish and fulfill his divine will [by ways] not immediate and direct, but by compass; not violating Nature, which is his own law upon the creation. The warrant of science was, almost from the moment that it came into being as an organized activity, to discover the laws governing nature, not to defer explanations to a God that violated those laws. It is not "Darwinism" that people like Wells want to overthrow. It is, as they'll admit in their candid moments, science itself they want to destroy -- to be replaced with their own narrow apologetics. Science taught me now to look for natural explanations for natural phenomena, and to eschew supernatural explanations. The study of comparative world religions and mythologies from around the world showed me that other people believed just as passionately as I did that they were right and everyone else was wrong about religious beliefs that are mutually exclusive, which means that they can't all be right and that perhaps I (e.g., Christianity) was wrong. I also did not like the arrogance of certainty that I saw in myself as a Christian as well as in my fellow Christians, and how intolerant of other peoples' beliefs we are. Finally, thinking like a scientist made me wonder how to deal with specific Christian claims, such as the Virgin Birth, the Resurrection, etc., which in conjunction with my study of other religious beliefs and mythological stories, seemed so obviously the product of human story tellers. The fact that all the central tenets of the Judeo-Christian belief system have antecedents in ancient Egypt, Greece, and Rome (floods, Virgin Births, Resurrections, etc.) was an obvious indication that we created God and not vice versa. 1. Neither a state nor the Federal Government can set up a church. 2. Neither a state nor the Federal Government can pass laws which aid one religion, aid all religions, or prefer one religion over another. 3. Neither a state nor the Federal Government can force nor influence a person to go to or to remain away from church against his will. 4. Neither a state nor the Federal Government can force a person to profess a belief or disbelief in any religion. 5. No person can be punished for entertaining or professing religious beliefs. 6. No person can be punished for entertaining or professing religious disbeliefs. 7. No person can be punished for church attendance or non-attendance. 8. No tax in any amount, large or small, can be levied to support any religious activities or institutions, whatever they may be called, or whatever form they may adopt to teach or practice religion. 9. Neither a state nor the Federal Government can, openly or secretly, participate in the affairs of any religious organizations or groups. 10. No religious organizations or groups can, openly or secretly, participate in the affairs of a state or the Federal Government..
Now go and visit First Freedom First. There is a sense of insecurity abroad in the world paralleling if not exceeding that which drove the first wave of American fundamentalism in the early twentieth century. People feel their whole world is crumbling around them, despite or even because of the rapid pace of technological progress. In these circumstances people need the kind of reassurance that can be given only by total commitment to a belief system which promises salvation and clearly identifies the supernatural source of that salvation. This level of commitment requires adherence to a worldview defined by a single text, and the chosen text then acquires a degree of authority that prompts a literalist reading even where such a reading defies the body of expert opinion. In an age facing overwhelming political and environmental challenges, many are seeking this level of reassurance. But as opponents such as Dawkins and Dennett are keen to point out, this kind of religious belief can all too easily lead to dogmatism, intransigence, and intolerance. If what I believe is absolutely true, then rival beliefs offered by others must be false and their influence should be curtailed. Mark Mathis, a producer of the film who attended the screening, said that "of course" he had recognized Dr. Dawkins, but allowed him to attend because "he has handled himself fairly honorably, he is a guest in our country and I had to presume he had flown a long way to see the film." Oh, riiight! Dawkins would fly all the way from England to see this excrement? His showing up had nothing to do with Dawkins' heavily publicized lecture tour of the United States or the 34th Annual National Conference of American Atheists right there in Minneapolis? Mr. Mathis said in an interview that he had confronted Dr. Dawkins in the question and answer period after the screening and that Dr. Dawkins withered. "These people who own the academic establishment and who have great friends in the media — they are not accustomed to having a level, open playing field," Mr. Mathis said. "I watched a man who has been a large figure, an imposing figure, I watched this man shrink in front of my eyes." That is not how Dr. Dawkins recalls it. He said Mr. Mathis said "enemies" were attempting to interfere with the film. "It is impossible to imagine what Mathis is afraid of," Dr. Dawkins said. "It is impossible to credit such bungling and inept public relations." After expending so much effort in packing the audience with ideological soul mates, to call it "a level, open playing field" is, I suppose, no more delusional than mistaking their applause and laughter for something other than an empty echo. Torrents of blood have been spilt in the old world by vain attempts of the secular arm to extinguish religious discord by proscribing all difference in religious opinions. Time has at length revealed the true remedy. Every relaxation of narrow and rigorous policy, wherever it has been tried, has been found to assuage the disease. The American theatre has exhibited proofs that equal and complete liberty, if it does not wholly eradicate it, sufficiently destroys its malignant influence on the health and prosperity of the State. It seems that PZ Myers has overtaken all others in the Antichrist poll among the Righteous Right! I was standing in line, hadn't even gotten to the point where I had to sign in and show ID, and a policeman pulled me out of line and told me I could not go in. I asked why, of course, and he said that a producer of the film had specifically instructed him that I was not to be allowed to attend. The officer also told me that if I tried to go in, I would be arrested. I assured him that I wasn't going to cause any trouble. Could intelligent design's vocal advocates potentially persuade a majority of people in this country or even the world? It is certainly possible. But I ask those Christians who have listened only to that side and have accepted it because they want it to be true: Are you really committed to "winning" at any cost? If honesty and "fair play" are sacrificed, can it really be called a victory? Who knew James was a prophet? Via Brian Switek at Laelaps. Well, you've got to give the produces of Excretion credit. They've given much merriment to all and sundry! And here's more from PZ on the buffoonery of the IDeologists. First Freedom First, a joint project of Americans United for Separation of Church and State and The Interfaith Alliance Foundation, will be airing a simulcast, entitled "Everything You Always Wanted to Know about the Separation of Church and State … but Were Afraid to Ask!," in 25 theaters across the country. The free event will take place on March 26 at 6:00pm eastern, 5:00pm central, 7:00pm mountain, and 6:00pm pacific. Other actors and celebrities scheduled to participate include Michael J. Fox ("Family Ties" and "Spin City"), Jack Klugman ("The Odd Couple" and "Quincy, M.E. "), James Whitmore ("The Shawshank Redemption"), Wendie Malick ("Just Shoot Me! "), Dan Lauria ("The Wonder Years"), Catherine Dent ("The Shield"), stand-up comedian and Air America host Marc Maron, singer/songwriter Catie Curtis and singer/satirist Roy Zimmerman. In addition, Americans who have fought for individual freedom will tell their stories. Invited guests include Bryan and Christy Rehm (who fought creationism in Dover, Pa. science classes), Matthew LaClair (a New Jersey high schooler who exposed religious indoctrination at his school), Roberta Stewart (an Afghanistan War widow who fought for equal rights for Wiccan veterans), Dr. Susan Wicklund (who wears a bullet-proof vest to provide reproductive services in underserved areas) the Rev. Madison Shockley (pastor and reproductive rights advocate) David and Ryan Altoon (who oppose fundamentalist proselytism at U.S. military academies) Melinda "Lindy" Maddox (who successfully sued Alabama "Commandments" Judge Roy Moore) and Susan Jacoby (author of The Age of American Unreason). A good, and educational, time will be had by all. This protects the freedom of speech for teachers in the classroom. I want teachers to be able to show those holes in Darwin's theory of evolution without fear of chastisement. Hays also does a "Luskin" (the technical term for self-contradictory dissembling). First he says that "[t]he bill does not allow or authorize the teaching of creationism or intelligent design" but then says that it would permit discussions about "competing theories." What other allegedly "competing theories" are there, particularly if, as the bill purports to do, the field is restricted to "scientific" views? [I]f Hays and other legislators want to go there in the name of "academic freedom," then they should be consistent. If it's OK for science teachers to discuss the holes in Darwin's theory of evolution, it should be OK for health teachers to discuss shortcomings with the "abstinence only" dogma that has been deemed the only acceptable talking point when it comes to preventing pregnancy and sexually transmitted disease. If it's OK for science teachers to talk about controversial alternatives to Darwin, it should be OK for health teachers to talk about birth control and abortion. That's more of a parental responsibility than a school responsibility. At this point we don't need to introduce any more controversy. It's already controversial enough. Yeah, Rep. Hays ... we already knew this bill is, as Mayo rightly puts it, "a thinly veiled attempt to inject religion" into public school science classes by political means, not about "academic freedom." The Dallas Observer has a mostly good article, "Battle Against Teaching Evolution in Texas Begins," on the coming school board wars over the revision of the state's science standards. Although there a couple of jarringly wrong items in the article, it is mostly a sober consideration of the history of how the state board wound up where it is and the issues at stake. It will be helpful in keeping the players straight. I really think this whole thing about not understanding climate change and global warming and the attack on science in general that we've seen from this administration is another clear example of how radical groups that have little or no understanding of the nature of science are dictating to scientists what they can and cannot research, what they can and cannot say about subjects that are vital to our health and future. Why, How Nice of You! In the same editorial a number of issues that the editorial board has deemed "frivolous bills" such as insuring creationism is included in classrooms and a person's right to bear arms was also labeled as "wasting time". "As a 'social conservative' it is my opinion that allowing for diverging ideas is the stuff this country was founded on. Creationism is a part of many individuals' beliefs and the editorial staff should not fear this inclusion in the classroom. Freedom of speech is a fundamental right that does not only belong to the media but to the people as a whole," said Mr. Steele. As Wes Elsberry said at The Austringer, it was most helpful for Mr. Steele to contribute to the documentation of how widely understood it is in Florida that the academic freedom bill's intent is to inject creationism into the public schools for religious rather than secular purposes. It will be of great assistance if this bill becomes law and the ACLU needs to bring suit. He Went and Did It Again! You may remember that Casey Luskin, Gofer General of the Discovery Institute, let it out of the bag that the "academic freedom" bill it has been pushing, most recently in Florida, is intended to permit the teaching of Intelligent Design Creationism by individual public school teachers. John West then rode to the "rescue," claiming Luskin was "misrepresented" and claiming that only "[i]f and when ID supporters are able to win the debate over whether ID science" will the pending legislation permit ID to be taught. Of course, West bizarrely claims it should be K-12 teachers, most of whom have no real science or philosophy of science training, who should decide "if and when" ID becomes science. This time there is no equivocation about ID being science in Luskin's "personal opinion;" only a straightforward claim that ID is a scientific alternative to evolution and, therefore, clearly falls within the legislation's protection of supposedly "scientific information relevant to the full range of views on biological and chemical origins." We've known for a long time that the rank-and-file IDers have trouble with the whole "nudge, nudge, wink, wink" business but, apparently, so does Luskin. ADJECTIVE: 1. Of, relating to, or marked by antithesis. 2. Being in diametrical opposition. See synonyms at opposite. The very fact that Godfrey, despite any difficulties he may have faced, is still able now to believe in God demonstrates neatly that evolution and belief are not "antithetical." It may not be easy, but who said that anything worthwhile comes easy? Retired Polk County science teacher Robin Brown who taught science for 31 years, including 15 years of teaching Darwinian evolution, said without the academic freedom bill she is "very concerned about the chilling effect that Florida's new science standards might have upon teacher academic freedom." Brown, a member of First Baptist Church of the Mall in Lakeland, added, "I believe in light of the new standards many teachers are presently unclear about the boundaries of how they can teach evolution." She rejected critics' claims that the academic freedom bill will result in teaching Intelligent Design or creationism. "I'm not talking about teaching religion in the science classroom. I would never support that and, in fact, this bill does not support that," Brown said. [T]he Baptist Faith and Message affirms that God created humans. The issue of evolution precipitated the origin of the first edition of the Baptist Faith and Message in 1925. In the context of cultural wars over Darwinism fought in every major American Protestant denomination and the famous Tennessee "Scopes Monkey trial," Baptists denied humans descended from primates with the affirmation that "Man is the special creation of God." God made humans a little lower than Elohim (Ps.8:5), rather than a little higher than other animals. In fact, the Bible presents humans as the crown or apex of God's creation. Brown already revealed the level of the so-called "information relevant to the full range of views on biological and chemical origins" that will be foisted off on some Florida children as "scientific," if this bill becomes law. It is nothing but quote mining, misinformation and misdirection, borrowed wholesale by the "cdesign proponentsists" from "creation science" with nothing but a coat of cheap paint slapped on. Anyone with the least lick of sense can see through this ploy as nothing more than an attempt to permit the use of taxpayer money and the power of government endorsement to support a narrow sectarian religious denial of the science of evolution. So, unless these people don't have a lick of sense, they are knowingly dissembling to the public and the very students they have a duty to educate. But at the drop of a hat they'll tell you that, without religion, there can be no morality ... while striving mightily to demonstrate the exact opposite. Darwinism, of course, does not permit for the existence of a supreme being, a higher power, or a God. [Ben Stein's] interviews with some of the professors who espouse Darwinism are literally shocking. The condescension and the arrogance these people have, they will readily admit that Darwinism and evolution do not explain how life began. One of these professors said it might have been that a hyper-intelligence from another planet came here and started our race. This from some professor either in the UK, I forget where it was, but can't be God. These people are so threatened by the existence of God, they will not permit intelligent design to be discussed. Professors have been fired, blackballed, and prevented from working who have deigned to try to combine the whole concept of evolution with intelligent design. Ben Stein's new movie is going to open to a thousand screens pretty soon, it's not out there yet. It's called Expelled. But the point of it is that these people on the left are just scared to death of God. It threatens everything. We, on the other hand, recognize that our greatness, who we are, our potential, our ambition, our desire, comes from God, and as part of our Creation, this natural yearning to be free and to practice liberty. That is how we think this country came to be great. It is how we think this country will continue to be great and to grow.